Here is a list of most common questions. If you can't find the correct answer here, try to search our Helpdesk. Eduard Helpdesk is the largest database of questions and answers related to Eduard Store, Websites and products. You should be definitely able to find answers there. In other case, please contact us using this contact form, using Eduard Helpdesk, or writing to support@eduard.com. Click on headings below to reveal more information about that specific question. I lost/forgot my password, how can I recover it? If you've lost or forgot your password, you can reset it by going to login page on our online store and clicking the "Forgot Password" link. You need to know your registration email in order to reset your password within Eduard Store. I lost/forgot my registration email, can I recover it? Contact us using the support form here, or at support@eduard.com. We will try to find your email address in our system. Can I change the currency on Eduard Store? By default, you will see currency which is associated with your country. You can only buy in that currency and this setting cannot be changed by you, nor by us. EU residents will most likely see EUR currency. US residents (and rest of the world) will only see USD currency. Czech residents will see CZK currency. Please refer to information on the Shipping and Charges page to find out how much will you pay for shipping to your country. Is there a minimal order cost on Eduard Store? Yes. The minimal order cost we will accept has to be $20 or more without the shipping costs. How can I solve possible claim? How can I get replacement? CVC (Card Validation Code) - You can find this code on the back side of your credit card. It's the 3 digit number at the very end of the signature line. You usually use this code when you want to validate your payment via credit card. The banks will not process tracsactions without it. What is the difference between normal PE sets and Zoom sets? Zoom sets are simplified version of our standard sets and only include some interior parts such as seat belts, instrument panel and other important parts for detailing the exterior. Zoom details sets are usually colored and are part of their respective standard set. 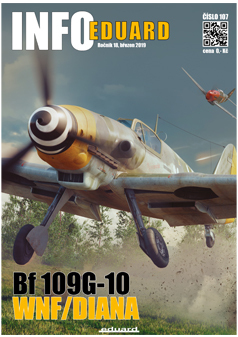 For example: You can buy a complete detail set #73388 for Bf 110C, which consists of 3 etches. The first etch from this set is usually for interior and can also be obtained as separate detail set with catalog number #SS388(Zoom). 2 other etches are standard parts of the details set (usually exterior).